After living in Montana with her family for some time, Marianna Sommers has finally decided to return to her Amish community in Indiana and marry her childhood sweetheart, Aaron Zook. Ben Stone, the English man that she fell for in Montana, is pursuing his music career, a sure sign that they aren’t meant to be together. But even though Marianna always thought that returning to Indiana and marrying Aaron was the right thing to do, she can’t help but miss Montana and the friends and family that she left behind. Her every move is watched by her Amish neighbours in Indiana, who are convinced that she’s becoming too liberal and worldly in her time away. Worse, none of them understand the new connection she’s made with God. As Marianna helps her brother and his girlfriend prepare for their wedding and the birth of their first child, she wonders whether what is right for Levi might not be what is right for her. Is it really God’s plan for her to join the Amish community and marry Aaron, even if they aren’t as a close as Levi and Naomi? Haunted by her mother’s old romance with an Englisher, Marianna doesn’t want to bring similar hurt to her family by leaving the faith, even if it means having to hide her true beliefs. But is this truly what God wants for her life, or just what she feels obligated to do? Will the reappearance of Ben change her mind? I only discovered Amish fiction a couple of years ago, but I quickly became a fan of this rapidly-expanding genre. 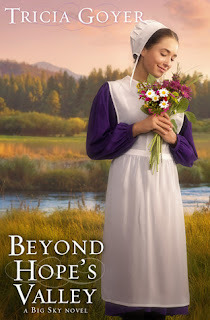 Plenty of established Christian authors are starting to dip their toes into the waters of Amish fiction, including B. J. Hoff, Lori Copeland, Kathryn Cushman, Mindy Starns Clark and, as you can see, Tricia Goyer. I have to admit, I hadn’t read anything by Tricia Goyer before I picked up Beside Still Waters in 2011, but I was immediately sucked in by her compelling plots and challenging spiritual messages. Beyond Hope’s Valley was on my “must read” list for 2012. I’m pleased with how Tricia decided to end the series, although I’m holding on to the hope that she revisits Marianna in future books. This final instalment was almost impossible to put down in places, and I became quite emotionally invested in the lives of the characters. I got angry at the nosy women in Indiana for their judgemental attitudes, felt spiritually challenged alongside Marianna, cheered Ruth on when she stood up to a man from her past, and felt incredibly proud of Levi for stepping up into the role of husband and father that had been placed before him. That said, I didn’t feel quite as wrapped up in the story and characters as I had in the previous two books. Beside Still Waters and Along Wooded Paths had totally blown me away and definitely made my list of top ten reads for 2011, so maybe I was setting myself up for a little disappointment. My qualms with this book are small, but I will voice them: I felt that the plot was a bit slow to get started, and a good twenty-percent of the book seemed to be spent setting up events that were to come. Having now finished the book, I kind of wish that that some of that space could have been shifted to the end of the book, so that we had more time to spend with Marianna and her chosen beau! The ending came quite quickly (and no, I’m not telling you who she chooses!) and as cheesy as I often find epilogues, I really wanted one this time! I also missed the Montana setting, since nearly the entire novel takes place in Indiana, or following Ben around on his tour. Tricia describes Montana so beautifully in the other books in the series and I hope that she chooses to set another series there as it made a great backdrop for these novels. But what Beyond Hope’s Valley was lacking in terms of setting, it made up for in the development of secondary characters. I really felt that Tricia delved further into the emotions of Ruth, Marianna’s mother, and her brother, Levi. Whole passages of this novel are told from Ruth’s perspective, and while I was initially sceptical about what her point of view was going to add to the novel, the inclusion of Ruth’s experiences heightened my sense of the family dynamics and cleared up some underlying issues that I’d been mulling over throughout the series. Ever wondered what difficulties Marianna’s parents had before they moved to Montana? Or why Ruth wasn’t keen on Marianna’s friendship with Ben? Now you’ll find out. While Tricia doesn’t dwell on Levi’s perspective so much as she does with Ruth, it was encouraging to see how much he’d grown since the first book in the series, and the scenes between him, Naomi and their child were really touching. We’d been given a teaser that included Levi at the end of Along Wooded Paths and I can tell you that this scene was just as good this time around, and made Levi even more endearing to the reader. Maybe it’s been too long since I read the previous books in the series, but I honestly felt that Tricia had developed her secondary characters a lot more in this book. I’m looking forward to her next Amish series, and even if she doesn’t revisit these characters (although I kind of wish that Levi and Naomi would get their own book), the strength of her character development makes me hopeful for what’s to come. Beyond Hope’s Valley is a satisfying conclusion to the Big Sky saga, and has the kind of ending that makes you sigh with relief and let out the breath you’ve been holding for the last couple of pages. Unlike some romantic series, I honestly didn’t know who Marianna was going to choose until I was almost at the end of the last book. I think that’s what makes this series so appealing; the characters change and develop so much over the course of the books that you can’t predict how the series will end. I’ve thoroughly enjoyed following Marianna on her journey to come closer to God and ultimately discover the man that she’s destined to be with. I’d like to think that I’ve grown along with her. The Big Sky series sticks out from the plethora of Amish novels in that it not challenges the readers’ perceptions of the Amish way of life, but it also challenges their own faith. Although Tricia likes to shake things up a bit by addressing certain conflicts within Amish theology, I can honestly say that I come out of these books not wondering whether the Amish are living their lives in a way that is pleasing to God, but whether I’m living my life appropriately. These aren’t books about pleasant young Amish women who like to bake and go on buggy rides with their beaus, but stories of real people struggling with the issues that we Englishers also have to deal with. There’s still romance in this book, but I’d be hard pressed to call this book predictable. If you’ve been intrigued by Amish fiction but you’ve been put off by the pastel coloured covers, this series would be a good place to start – but do begin with Beside Still Waters. This is not a series that can be read out of order, but Beyond Hope’s Valley is well worth the wait in getting there. Review title provided by B&H Publishing.